In Greek mythology, Icarus, the son of the master craftsman Daedalus, who created the Labyrinth, met a tragic ending. Icarus and Daedalus were desperate to escape from Crete. So Daedalus constructed wings made of feathers and wax. As Icarus prepared to make his escape, Daedalus warned his son of complacency and hubris. Icarus shouldn’t neither fly too high, nor too low. If he flew too high, the sun would melt the wax. However, if he Icarus flew too low, the dampness of would weigh down the feathers. It seemed Icarus was between the devil and the deep blue sea. And so it proved to be. Icarus chose to ignore his father’s wise words, and flew too close to the sun. The sun’s rays melted the wax, and Icarus fell into the sea. He became the first of many people who flew too close to the sun. Sadly, this includes many musicians. Among them are Syd Barrett, Skip Spence and Brian Wilson. These three legendary musicians flew too close to the sun, and as a result, never quite filled their early potential. Sadly, neither did Ikarus. They could’ve gone on to become one of the greatest German rock bands of their generation. Sadly, Ikarus’ discography consists of just one studio album Ikarus. It was released on the Plus label in 1971, and has just been reissued by the reissue label Long Hair. Ikarus showcased a talented, pioneering group, who many thought were destined for greatness. Their story began a few years earlier.. It was in the mid-sixties, in the musical hotbed that was Hamburg, that Ikarus were formed. Ikarus were just the latest beat group that had been formed in Hamburg. This was where The Beatles served their musical apprenticeship a few years earlier. Now a whole host of local groups wanted to follow in the fab four’s footsteps. Ikarus were no different. So they spent evenings and weekends practising in various Hamburg basements. They were determined to hone their sound, before making their debut.This didn’t take long, as Ikarus featured some talented musicians. This included classically trained keyboardist Wulf Dieter Struntz and bassist Wolfgang Kracht. His party trick was to play a violin with his gloves on. Music seemed to come easily to the members of Ikarus, and it wasn’t long until they began to play live. By 1966, Ikarus made tentative steps onto Hamburg’s live scene. Ikarus’ earliest concerts took place in youth clubs, where they played cover versions of popular song. At first,Ikarus were called Beautique In Corporation. Soon, this was soon shortened to BIC. This found favour among the band’s audience. Although a relatively new group, BIC quickly won over audiences. Soon, they had large and enthusiastic audience. BIC played what they wanted to hear. They weren’t above playing covers of hits by Elvis Presley and Tom Jones. This was easy on the ear of the audience. However, before long, BIC’s setlist changed. The band members began to write their own songs. Audiences expected to hear original material. They didn’t just want to hear cover versions. This suited the members of BIC, who were classically trained musicians. Composition came easy to them. These new songs were added to BIC’s sets. Some of these songs had a psychedelic sound. BIC’s music was evolving, as music evolved. This proved popular when BIC played live. By then, BIC had graduated from the youth club circuit, and were by now familiar faces on the Hamburg and North German music scene. Their music was a mixture of psychedelia and rock. However, there was an element of comedy in BIC’s sets. Some of the members of BIC enjoyed the new generation of German vaudeville comedians. So they began to combine vaudeville comedy with their psychedelic sound. It proved a potent and successful combination. Soon, BIC were one of the most successful Hamburg bands. They were well on their way to becoming one of the leading lights of the Hamburg scene. So when they saw an advert for the 1969 Hamburg student beat band competition, BIC decided to enter. All of the top Hamburg bands entered. The competition was fierce. Hamburg had a thriving music scene. While the other bands were professional, BIC were still an amateur band. This didn’t matter. When BIC took to the stage, they quickly won over the judges with their psychedelic sound. Once all the bands had played, the judges conferred and the winner was announced. It was BIC, the only amateur band in the competition. They had triumphed, and won what was Hamburg’s most prestigious competition. Having won the 1969 Hamburg student beat band competition, BIC were invited to in the 1970 Hamburg Pop and Blues festival. It took place between the 1st and 3rd of April 1970. BIC were going to rub shoulders with some of the biggest band on that early seventies. Among them, were Chicken Shack, Steampacket, Alexis Corner and Hardin and York. Despite such an illustrious lineup, it was the hometown band that won the hearts and minds of the audience. BIC had stolen the show. After their performance at the 1970 Hamburg Pop and Blues festival, things happened quickly for BIC. A live album of BIC’s performance at the Hamburg Pop and Blues festival was released as their debut album. It was augmented by performances from Frumpy and Tomorrow’s Gift. The album sold fairly well, and it looked like BIC’s star was in the ascendancy. Just a few months later, BIC’s lineup changed, when two new names joined the band. Now BIC was a five piece band. The new lineup of BIC was then asked to open for British band Uriah Heep on their forthcoming tour. This was the start of the rise and rise of BIC. Not long after this, BIC acquired a manager, who was also a concert promoter, Will Jahncke. One of his first suggestions was that BIC changed their name to Ikarus. While this seemed more in keeping with the psychedelic and progressive rock scene, BIC were a popular and successful band. However, the five members decided to change the band’s name to Ikarus. Following the name change, Ikarus’ music changed. They were inspired to do so, by King Crimson, Yes, Colosseum and Frank Zappa. Soon, Ikarus were fusing fusion with progressive rock and experimental music. There was still a slight psychedelic sound to their music. However, the new sound didn’t please everyone. When Ikarus played live, the audience were divided by the stylistic change. While some embraced and welcome Ikarus’ new sound, some weren’t as sure. They weren’t won over by the move towards progressive rock. Instead, they felt the lengthy songs, and changes in tempo and time signature were self-indulgent. However, critics disagreed, and continued to champion Ikarus. 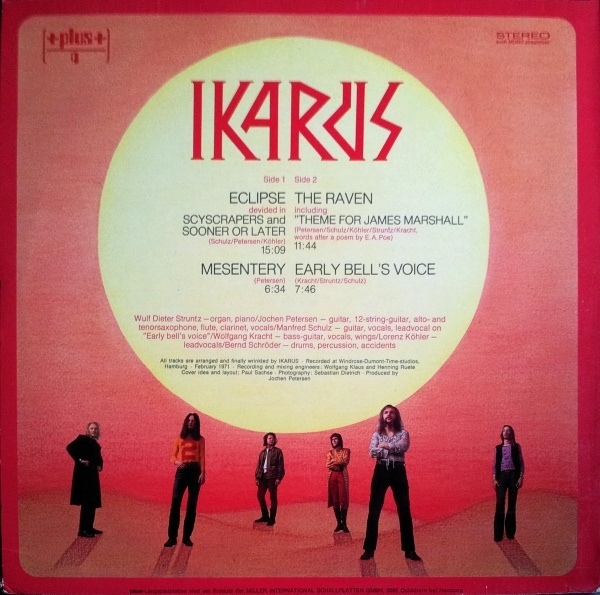 With the critics championing their music, it made sense for Ikarus to record their debut album in the second half of 1971. So the five members of Ikarus made their way to the Windrose Studio, Hamburg. By then, the members of Ikarus had written four songs. Each of the songs were collaborations between members of the band. That was apart from The Raven Including “Theme For James Marshall.” It was an Edgar Allan Poe poem set to music written by four members of Ikarus. This became a near twelve minute epic that featured on side two of Ikarus. With the album written, the band began recording their debut album. At the Windrose Studio, there was a sense of anticipation.The original members of the band had spent six years playing in clubs and festivals. All this was preparation for the day that Ikarus recorded their eponymous debut album. If things went to play, Ikarus music would be heard by a much wider audience. The members of Ikarus realised this as they setup their equipment. By then, Ikarus’ rhythm section featured drummer Bernd Schröder, bassist Wolfgang Kracht and guitarist Manfred Schulz. Jochen Petersen played guitar, but also switched between 12-string guitar, alto saxophone, tenor saxophone, flute and clarinet. Wulf Dieter Struntz played organ and piano. Lorenz Köhler took charge of the lead vocals on three tracks; while Manfred Schulz featured on Early Bell’s Voice. Producing Ikarus was Jochen Petersen. Eventually, Ikarus was complete. Now all that was left was to release Ikarus. With Ikarus complete, it was scheduled for release in February 1972. Miller International had decided to release it on their Plus imprint. However, before that, critics had their say on Ikarus. For some time, critics had championed Ikarus’ music. Their eponymous debut album was no different. 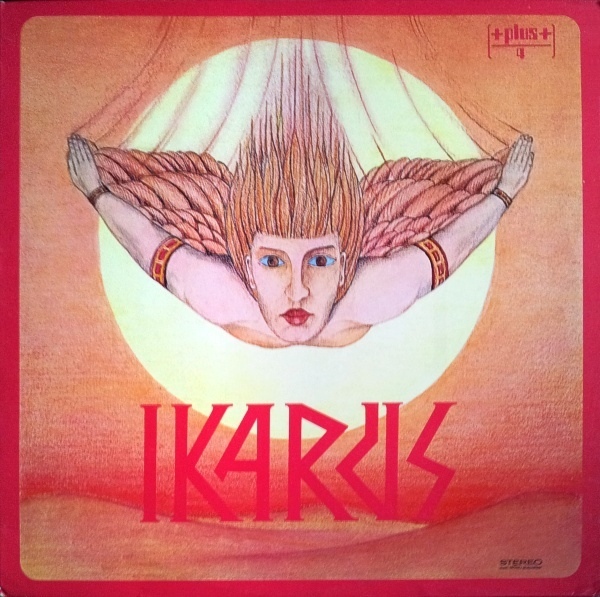 Ikarus, with its combination of fusion, progressive rock and psychedelia met with the critics approval. Critically acclaimed reviews followed, and Ikarus, who were still an amateur band, looked like they had a successful album on their hands. So it proved to be. Ikarus sold well, and soon, the band were playing sellout shows across Germany. In Hamburg, Ikarus’ home town, they were asked open for Deep Purple. It looked like Ikarus were were well on their way to becoming one of the stars of the German music scene. Those that heard Ikarus concurred. Although Ikarus only featured four tracks, they ooze quality. That’s apparent from Eclipse, where Skyscrapers gives way to Sooner Or Later. It’s a fifteen minute epic, featuring Lorenz Köhler on lead vocal. 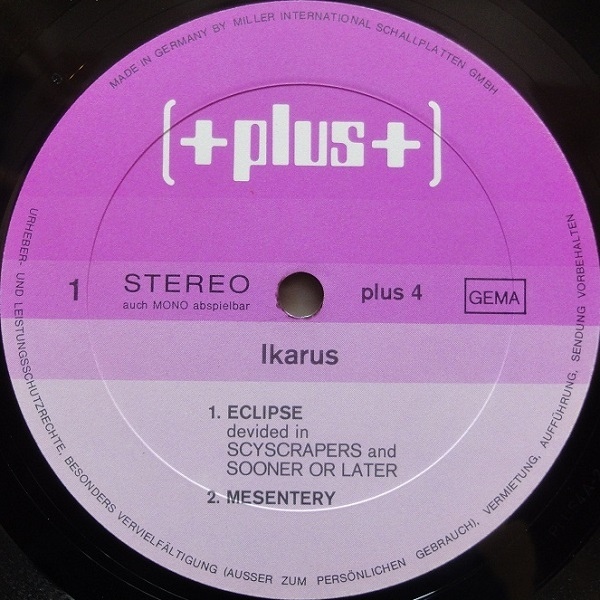 Eclipse epitomises Ikarus’ sound. They combine progressive rock with fusion, classic rock and jazz. King Crimson, Yes, Pink Floyd, Soft Machine and the pioneers of fusion seem to have influenced Ikarus, as they take the listener on a Joycean musical journey. Blazing, blistering dual guitars are unleashed, as the rhythm section create a hypnotic backdrop on Skyscraper. They’re augmented by brief washes of Hammond organ. Then when Lorenz delivers the lyrics, it’s apparent that Ikarus have a social conscience. They saw Skyscrapers as despoiling cities, and were worried about the effect it was having on the ecosystem. Their lyrics are an impassioned plea: “to save nature it’s a treasure.” Gradually, the arrangement builds, as a flute, clarinet and Hammond organ are added. Everything is added at just the right time. The addition of a clarinet proves to be a masterstroke as as fusion meets progressive rock. When an acoustic guitar is added, it’s reminiscent of Pink Floyd’s later sound. By then, Ikarus have dropped the tempo, before rebuilding, and creating a dramatic backdrop to Lorenz’s latest plea. This is something Ikarus continue to do, and it always proves effective. There’s also continual stylistic changes, as Ikarus switch between disparate genres. After another tempo change, strings sweep adding to the emotion of the song, before Lorenz urges the listener to: “think about the situation.” Later, Ikarus jam with the Hammond organ and rhythm section becoming one. Swathes of strings which add a dramatic, symphonic sound as this genre-melting journey is almost over. By then, the arrangement is choppy and urgent. That’s down to the searing, mesmeric guitars, and the bass that walks the arrangement along. They accompany Lorenz’s vocal, before it drops out. Now it’s time for Ikarus to jam, and showcase their considerable skills, before this Joycean musical epic reaches a close. Mesentry is another thought provoking song from Ikarus. It has an understated pastoral introduction. Birdsong punctuates the arrangement, which quickly, heads in the direction of folk-rock. There’s an element of theatre to the vocal. This makes me think of Queen in their pomp. However, quickly, Ikarus change direction. The Hammond organ, rhythm section and chiming guitars accompany Lorenz’s thoughtful vocal. It’s augmented by choral harmonies. Again, Ikarus experiment, changing tempo and style. There’s a soulfulness to the vocal and harmonies. Then Ikarus throw a curveball, and the track heads in the direction of avant garde and experimental music. Sci-fi sounds, moans and drones are augmented by lush strings as an otherworldly soundscape meanders beautifully along, proving how versatile inventive and imaginative Ikarus were. 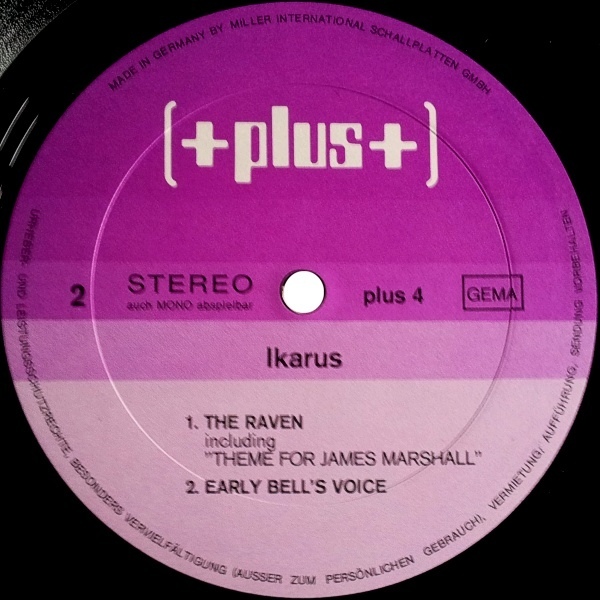 Another epic is The Raven Including “Theme For James Marshall. This was a poem by Edgar Allen Poe set to music by Ikarus. It’s another lengthy track, lasting nearly twelve minutes. The introduction sounds like theme to an early seventies television show. Saxophones play, and the rhythm section join the fray, driving the jazzy arrangement along. Soon, Ikarus are in full flight. Again, they tease the listener, dropping and increasing the listener, as they switch between fusion and progressive rock. Sometimes, the two become one. Ikarus deploy every weapon in their considerable musical arsenal. This includes braying saxophones, washes of Hammond organ, a driving bass, rolling, cascading drums and searing guitars, Then at 2.22 it’s all change. The arrangement grinds to a halt, before awakening from its slumbers. A myriad of sound gradually fill the arrangement, before elements of free jazz, progressive rock, fusion and classic rock unfolds. Slow, moody, gothic and lysergic describes the backdrop to the vocal. That could change at any moment and does. Instruments are added, and disappear. So do sound effects. A cannon explodes, water flows and thunder sounds. By then, cinematic describes the arrangement. That’s until, there’s a nod to Jethro Tull around 8.30. Then the cinematic sound returns as the tracks becomes melodic, elegiac and ethereal as folk-rock meets progressive rock and jazz. Early Bell’s Voice closes Ikarus. Just a lone piano plays thoughtfully. That’s enough to capture the listener’s attention. Soon, the rest of Ikarus enter. The rhythm section are joined by a Hammond organ, saxophone and guitar. Gradually, the tempo rises, and Ikarus are in full flight. They’re powered along by the drums. Washes of Hammond organ, searing guitars and bursts of braying saxophone combine, before the tempo drops. Harmonies soar above the arrangement, as fusion meets progressive rock. Constantly, Ikarus experiment with the tempo, and on occasions vary the time signature. Even the vocals change. This time, their theatrical, more than hinting at their love of vaudeville. It’s an interesting and innovative combination. Especially, with the changes tempo. Later, Ikarus can’t resist throwing one last curveball. Bells ring, before the tapes speeds up, giving the arrangement a cartoon quality. Ikarus seem determined to put a smile on the listener’s face, as they close their eponymous debut album. Sadly, Ikarus was the only album that Ikarus ever released. The Ikarus’ story is a case of unfilled potential. On Ikarus, listeners were introduced to what could’ve been one of the most successful German bands of the seventies. Their was bang ‘on trend’. Progressive rock and fusion were both hugely popular by the mid-seventies. That’s when Ikarus were offered a contract by Metronome. They were the owner of the legendary Brian label. For Ikarus, this was the opportunity to dine at the top table in German rock music. Surely, this was an offer that Ikarus couldn’t and wouldn’t resist? They did. In the mid-seventies, Ikarus were still an amateur band. Its member felt that becoming a professional band was risky. There was no guarantee that their albums would sell. As an amateur band, they had the best of both worlds. Music was a hobby, one they were good at and that they made money with. The live circuit was lucrative. It was a good way for the members of Ikarus to augment their income. However, to become a full-time band was a step too far for some members of Ikarus, and they decided the band should split-up. It was a case of what might have been. Listening to Ikarus nearly forty-four years after its release, and one can’t help but wonder if the members of Ikarus regret their decision? Do they ever wonder what would’ve happened if they had signed to Metronome? Maybe they would’ve gone on to enjoy the same success as Can, Guru Guru, Eloy or Birth Control. Or maybe, it would’ve been another generation before Ikarus’ music finally received the recognition it deserves. That was the case with Neu!, Harmonia and Cluster. What I do know, is that Ikarus had the talent to reach the higher echelons of German rock music. That’s apparent on Ikarus, which was recently reissued by the Long Hair reissue label. The reissue includes a bonus track, Sunwave, a sixteen minute epic, which is welcome addition. Just like the rest of the music on Ikarus, it’s a tantalising reminder of another of the nearly men of German rock, Ikarus, who could’ve and should’ve, enjoyed a long and successful career. ← THE VELVET UNDERGROUND-LIVE AT MAX’S KANSAS CITY.